This annual symposium at Blue Ridge Assembly in Black Mountain, NC featured lectures on botanicals childhood metabolic syndrome, reversing chronic neurological disorders, homeopathic treatment for horses, treatment of acute psychosis, and more. 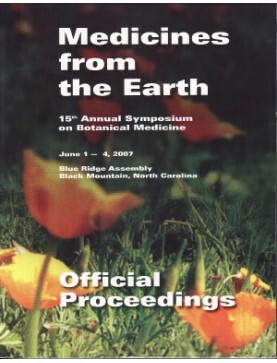 2007 Medicines from the Earth: Conference Book. Order download of PDF file on this page. ..
Panelists: Mary Bove, ND, Deborah Frances, ND and Chanchal Cabrera. Discusses protection from e..
Panelists Dharmendra Dube and Sumita Prajapati continue discussion from Part 1..
Panelists: Dharmendra Dube and Sumita Prajapati explain the intricacies of Ayurvedic pulse..
Speaker: Sumita Prajapati. Pulse diagnosis reveals the underlying causes of these conditions an..
Speaker: Dharmendra Dube. Learn to use the principles of this ancient system of medicine to improve ..
Panelists: Roy Upton, Michael Tierra, Dharmananda Dube and Sumita Prajapati (Ayurvedic Va..
Speaker: Teresa Boardwine. Demonstration class for creating medicinal salves and tonics in your kitc..
Speaker: Sumita Prajapati. The principles of Ayurveda are used to balance the physiology of wom..
Speaker: Walter Crinnion. Damage to the brain and nervous system occurs from toxins which cause..